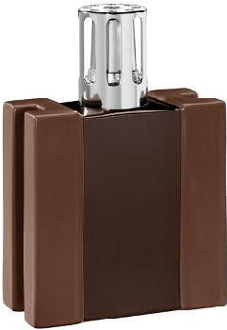 The geometric shape of the Lampe Berger H Chocolate lamp in enameled porcelain and its color contrast (mat and gloss effects) underline its architectural design. Designed by Jean-Baptiste Sibertin-Blanc. The lamp is shipped in a nice gift box with instructions, funnel, burner and tops. Tops in shiny silver. Capacity: 390ml.